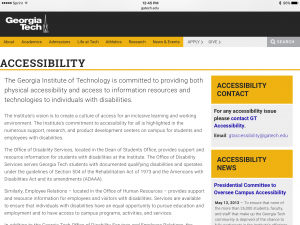 Upon more research, I did find the web page on disabilities on the Georgia Tech website. 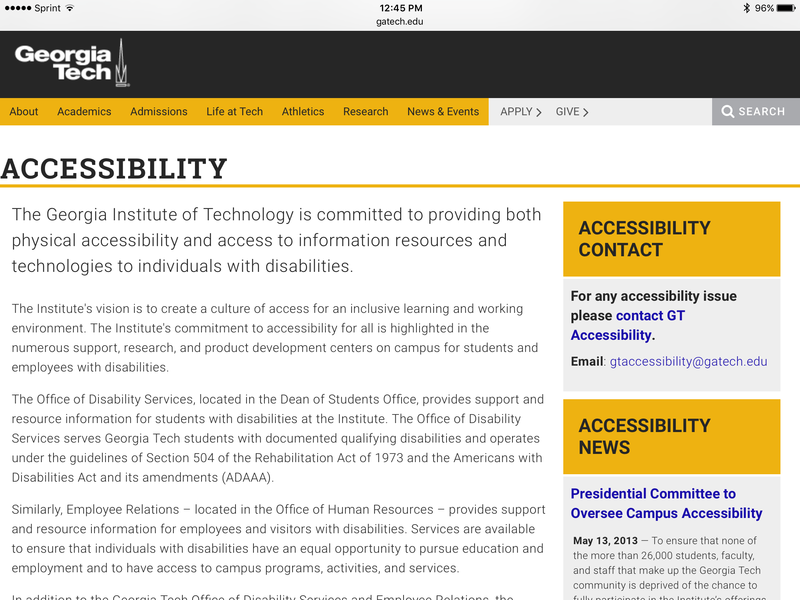 This web page is called “accessibility” and has ample information on how Tech accommodates those or are in a wheelchair or have other disabilities, and there is a contact email and phone number that the user can contact if they have any questions. 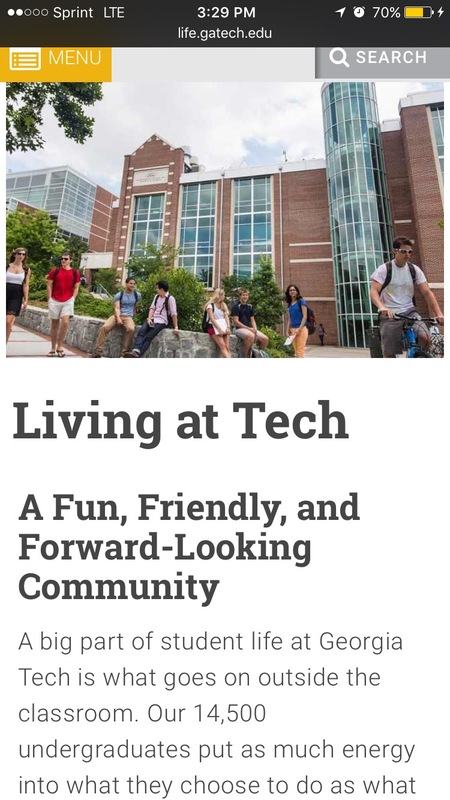 After clicking on “Life at Tech”, there are links to research opportunities and amenities sush as the large gym and diverse dining options. The picture shown is of active students that are walking and riding bicycles. However, no matter where I look on the website, I cannot find any information that might enlighten me on the handicap access on campus or how those with disabilities might be accommodated. 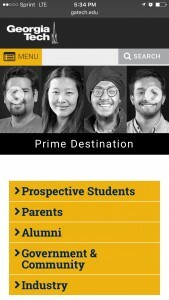 This lack of access to information would automatically make me think that if I were in a wheelchair, I may not chose to go to Tech in fear that getting from class to class would be too difficult. 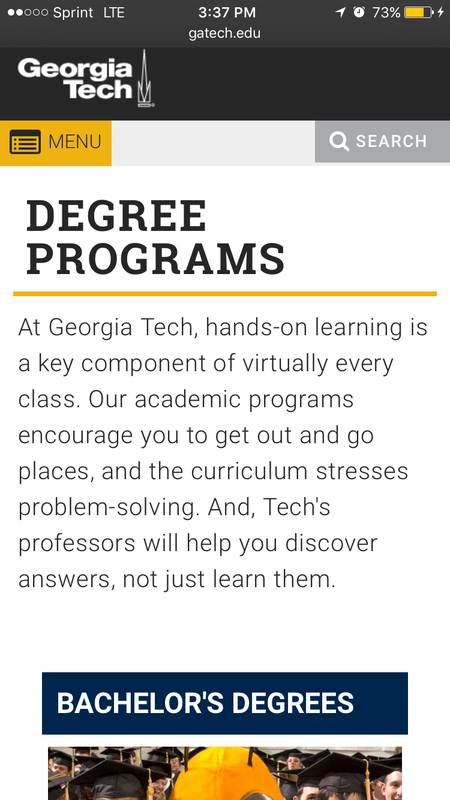 On the “about” page on Georgia Tech’s website, this video, “This is Georgia Tech”, gives an idea to the public about what Georgia Tech is looking for in their students. It also gives a few examples of the kind of missions and research that Tech is involved in. The new technology that Tech is working on shows that Tech has a multitude of resources readily available in order to impact the globe in a positive way. 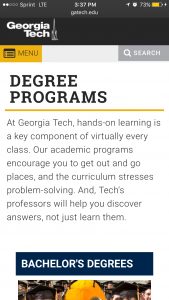 The Georgia Tech website is open to the public, and it is not necessary to have an account in order to view the information. There is no option for the public to add information to the website which prevents irrelevant text from accumulating such as doxing, cyber bullying, or the posting of inaccurate information. 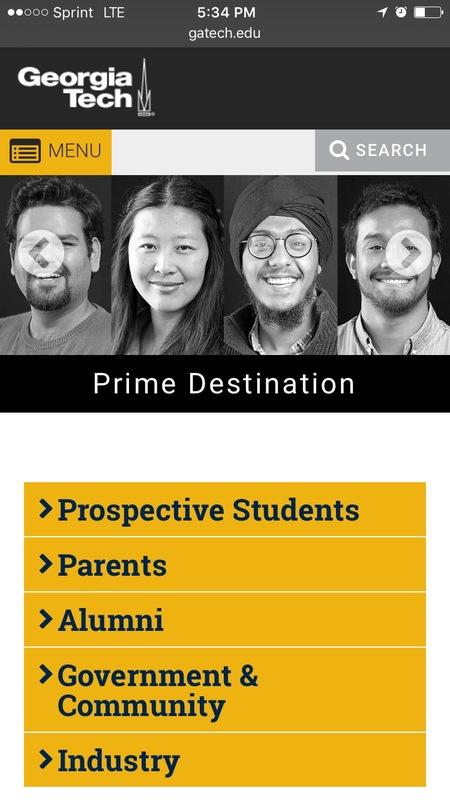 The site is attractive as it is straight edged, well organized, and sticks to the theme of black and gold colors. 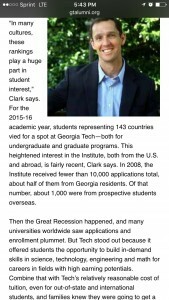 On the desktop version of the website, there is a link on the aforementioned banner that says, “look at why more international students are competing to come to Georgia Tech, and what their lives are like once they’re here” (Georgia Tech). 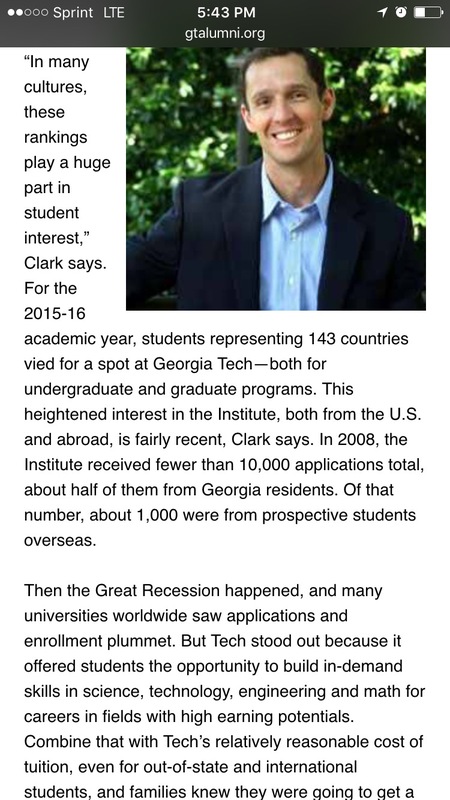 After clicking on the link, I get a page about how 10% of all the applications Tech receives are from international students. 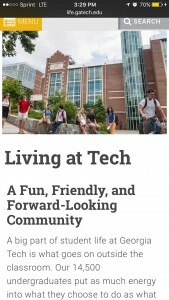 It also talks about the financial standpoint of Tech mentioning that for its comparatively average tuition and above average academic experience, you will get more bang for your buck at Tech most other schools. 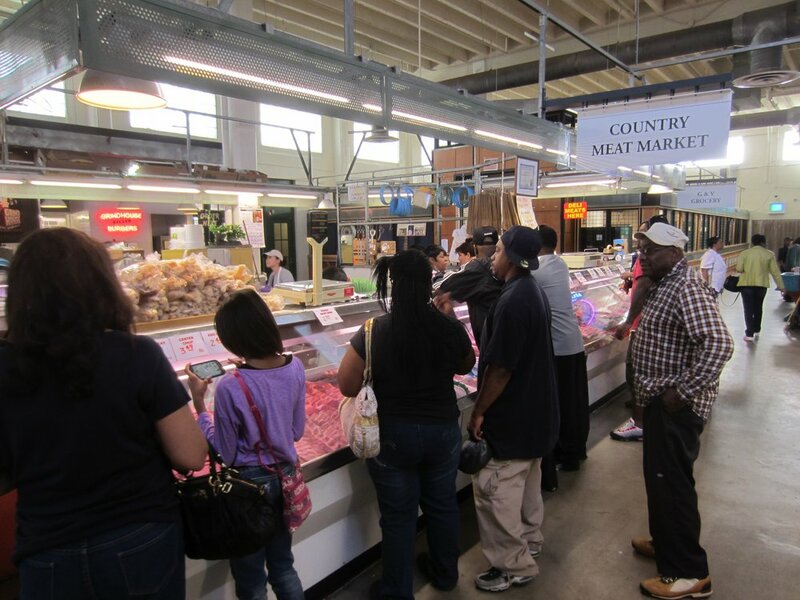 “Sweet Auburn Curb Market Photos.” Yelp. N.p., n.d. Web. 18 Feb. 2016. <http://www.yelp.com/biz_photos/sweet-auburn-curb-market-atlanta?start=120>. This photo of the Sweet Auburn Curb Market, located in Atlanta, Georgia, gives an idea of the hustle and bustle that passes through the market on a day to day basis. The historic “Municipal Market” sign looms above the visitor’s heads to give a prod reminder of the progress that the community has undergone. The Sweet Auburn Market, located in Atlanta, Georgia, provides many convenient resources to its community. 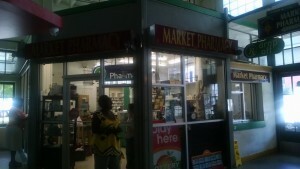 The market consists of restaurants, bakeries, a produce stall, a fresh meat stall, and this walk up pharmacy. The market puts a big emphasis on accessibility so that those who do not have access to transportation can have a close place to stop by when they need a prescription filled or buying groceries for the night’s meal. 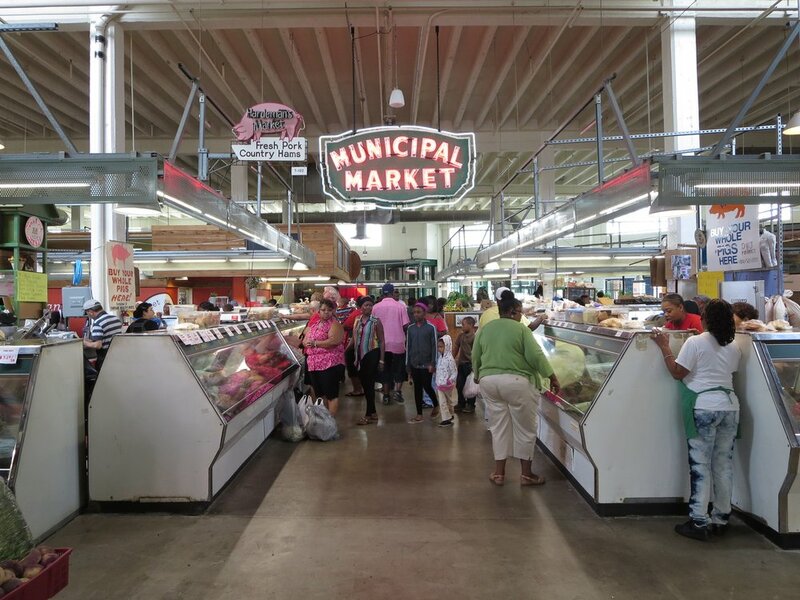 The Sweet Auburn Curb Market, located in Atlanta, Georgia, has been an important resource for the people of that community for decades. 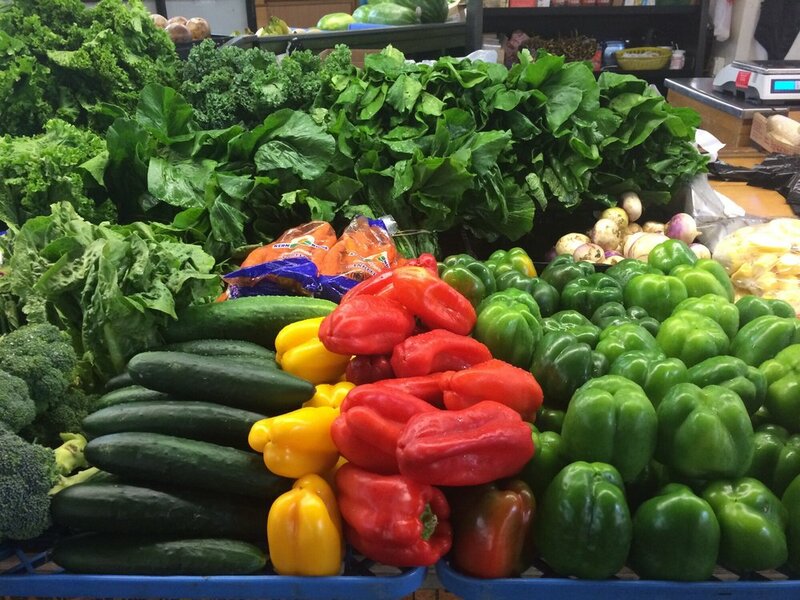 The market offers fresh, beautiful fruits and vegetables for reasonable prices. The market reminds us that even living in the city, it is important to take care of your body. 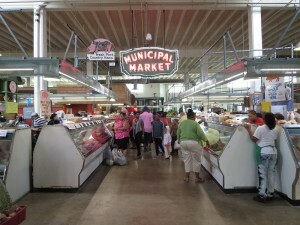 The Sweet Auburn Market, located in Atlanta, Georgia, is a welcoming place in which people from all over the community and from all socioeconomic statuses can join together. All of the vendor’s items are inexpensive and are great quality. It is a perfect place to stop for a quick lunch, to satisfy your sweet tooth with a cookie, or to shop for groceries.